Tidying. For some people, it seems like bore-to-death activity. But, for me personally, I love tidying (my room, my office-space at home, even my desktop screen at my laptop/PC) regularly, around once a month, because of my bad habit to clutter everywhere everyday. So, once a month (or twice, or whenever my eyes sore to see the mess around my space), I will spare some time to tidy them all (I admit that some of my tidying activities is my procrastination stuff. When i’m quite stressed out about my works, I will killing time by tidying my super-messed-up desk). 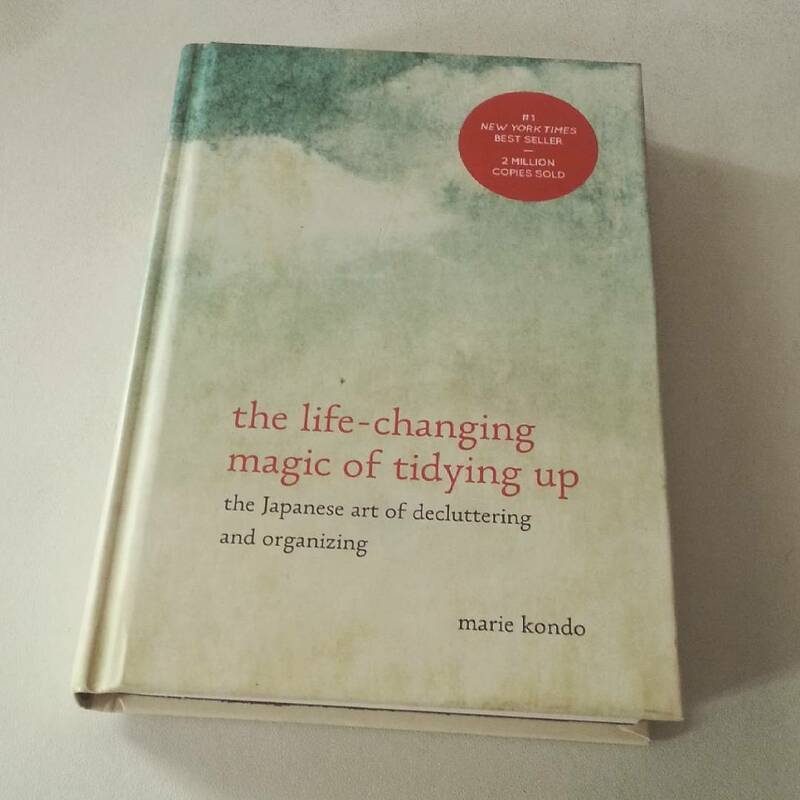 And last month, accidentally, I saw a book titled The Life Changing Magic of Tidying. I am kinda attracted to it. And last month, I bought it at Kinokuniya. According to Marie, tidying can be divided into 2, a comprehensive tidying and daily tidying. If you do as the book explained, you won’t have to do the comprehensive tidying quite often. Maybe you just need it once a year, or even once in a lifetime. Daily tidying, basically, is just a process where you put the things back in order (or storage) you have defined before in the comprehensive process ones. If you have done comprehensive one, I believe that much (imagine those 20 big bags) of your current stuff won’t be exist anymore, leave you with the essential things in your life. Marie also talks about how people say to overcome rebound (you clean your desk and the next day it already a mess again. Just like rebound of people take a diet), we should not take an aggressive and dramatic action. But, it just seems not working, Marie said. Instead, you have to allocate special time to finish quickly and do it at once when you’re doing comprehensive tidying. I guest, it also quite true. Whenever we just do small portion of tidying, the clutter will always be back with the speed exceeds the momentum we want to tidy our space (at least for me). The golden rule is simple, whenever you want to discard, ask yourself ‘Do this thing spark joy in your life?’ I believe that for some items, we will answer it easily. But, for some, it will quite hard (for me, it will be the books). For example, Marie said that you don’t need that many books (while I want to build small library at my home :p). Just take it out, and if you someday really really need it so badly, you just need to repurchase it. The essential of a book is not in the book physically, but the content which you have read before. With this method, you will learn that you live with so many unused and unimportant items in your life until now. You will be forced to live to the essential part and essential stuff of your life too. Therefore, this kind of tidying, I believed, is also a learning part of decision-making skills and how to focus on your most important things. (I also link this principle to Paretto’s law, the 80/20, which I believe that only 20% of our belongings is contribute significantly to our 80% daily life, while the 80% of our stuffs is not that important). At the end of the book, she wrote about how her client’s life changed drastically after doing the Tidying (after all, it’s the title of the book, right?) For example, there is a woman who finally found her truly passion in life. At first, she was working at big corporate in IT part. However, after finished tidying her bookshelf, she found that the majority of books she kept is correlated to social welfare. She want to help others by taking care their children, so that working parents will be able to go to work without worrying their kids. Afterward, she opened a child-care center. Some of Marie’s clients also said that their health quality increasing after doing the tidying (even some of them were losing weight). Well, Marie said that since our body is also affected by our environment, by detoxing your spaces, the body will also detox itself. There are several people who had a diarrhea the next day after finishing the tidying, and they said it made their body lighter than before. The logical explanation for this phenomenon, according to Marie, are, since the clutter and stuff at your home significantly reduced, the air circulation will be better and fresher, the dust piles will be reduced, and therefore, it will increase our quality of life. After reading this book, I intend to apply it to my own home, where I think the clutter is too much (and stored at one place like a warehouse, but still I believe that it’s better to discard the real unused items). But, somehow, I am quite afraid to discard my stuff (especially my books :P… so many unread books, but Marie said the unread books are likely never read for the rest of my life. Oh No!!!). Since I bought the book, I believe that tidying do have an important benefit, and after finished reading it, I should apply it, right?